Pranic Healing® is a highly developed, well tested, no-touch modality that directs energy according to specific areas of mental, emotional or physical concern. It is not only a system that will help with physical healing, it is a system that has tools that can be used in every aspect of every day life. So was the idea put forth by Choa Kok Sui, the founder of modern day Pranic Healing. A chemical engineer and businessman by trade, and an esoteric seeker and teacher by calling, Master Choa became interested in the Eastern ancient art of energy healing at a young age. He brought together a group of clairvoyants, doctors and energy healers to test the different energy healing modalities and record the results. His experiments culminated into repeatable applications that reduced or even completely alleviated symptoms of many different ailments. In 1987 he published his findings in the book The Ancient Science and Art of Pranic Healing, which later was re-titled Miracles Through Pranic Healing. Under the tutelage of his teacher, Mei Ling, Master Choa continued to experiment and expand the Pranic Healing techniques, distilling his findings into very applicable “recipes” in such books as Advanced Pranic Healing, Pranic Psychotherapy, andCrystal Healing, and many others. Pranic Healing has now spread throughout the world, and his students continue to experiment, record and teach Pranic Healing, fulfilling Grand Master Choa Kok Sui’s dream of having a healer in every household. Ready to implement the skills you've learned in class? Lots of opportunities to get questions answered, practice healing, and be guided to work on yourself. Check out the PH Studio offerings. The powerful Meditation on Twin Hearts now available as digital audio! 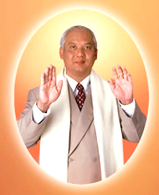 "Of all the techniques developed and taught by GrandMaster Choa Kok Sui, perhaps none prompts as many glowing testimonials of personal healing and positive life transformation as the Meditation on Twin Hearts. This meditation is truly special. It works on the physical, mental, and spiritual levels to open the heart chakra (the emotional heart) and the crown chakra (the spiritual heart), thereby enabling you to draw down a great amount of high-quality divine energy into the crown. The prana that this meditation produces greatly promotes physical and mental health as well as inner illumination." Pacific Northwest Pranic Healing is an independent non-profit organization whose mission is to support and enhance the growth and development of MCKS Pranic Healing® in the Pacific Northwest. It supports and sponsors activities including free weekly clinics/community healing sessions, classes, Full Moon Meditations, a monthly newsletter, special events and annual get-togethers. A current major goal is identifying and supporting a physical "home" dedicated exclusively to the principles and practices of MCKS Pranic Healing® and Arhatic Yoga®. Pacific Northwest Pranic Healing is organized as a state non profit corporation, and has a board comprised of Pranic Healers that meets monthly. 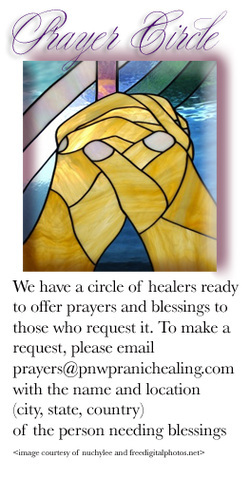 All Pranic Healers are invited to provide input, suggestions and concerns to the board and to attend an annual open meeting. Please email board@pnwpranichealing.com if you would like to contribute or need more information. The current board members are: Aarti Kapila, Gina Keller, Paul Brown, Yen Tan and Sophie Mansuet.